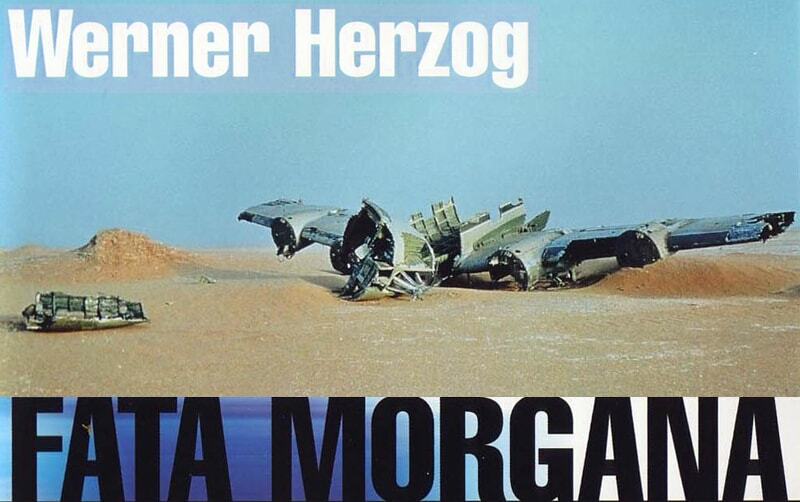 Finally I found the time and peace to watch one of the strangest movies that I have ever seen, Werner Herzog’s (Offical Site, Wikipedia) Fata Morgana (Wikipedia, IMDb). Footage prepared for a SF movie that never realized, converted into an impressionistic allegory and movie full of phantasms. Fata Morgana is a movie that escapes every description. Having read several critics’ voices, as well as Herzog’s comments in the excellent interview/(auto)biography book Werner Herzog – A guide for the perplexed, I was eager to see this old and special movie. Having laid my hand on a collection of Werner Herzog’s old movies recently, I prepared some good Japanese sake, and was ready to enjoy the move. The initial sequence of airplanes landing on a very hot day, again and again, sets the stage for a series of dream-like sequences in this movie. Divided into three parts, the movie tells its story only by visual impressions and the reading of the Mayan creation myth Popol Vuh, at times intermixed with some Leonard Cohen songs. Part One Creation introduces the desert as the origin of the world, accompanied by the initial creation myth before humans were formed. Part 2 Paradise is when humans enter into the desert. Full of ramshackle houses and rotten buildings, the contrast of the spoken words and imaginary cannot be more stunning. The final part 3 The Golden Age is full of absurdities and strange appearances, not surprisingly also most humans appear here. Watching this movie is more a visual experience for me than about seeing a story line. While there are many ways to interpret the relation between the Popol Vuh and the movie sequences, for me it is more a visual experiment that tries in some sense to hypnotize the audience. For those who love strange movies, an absolute must. For all others probably a torture. i’ve enjoyed many of wh’s movies (and commentaries! ), and found others to be utterly unwatchable. this is one of the latter for me, as you surmise :). thanks for the recommendation. I know Jodorovsky from the El Topo, so I surely will love this move you recommended, although reading the description it does look very different from Werner Herzog’s movie. check out “jodorowsky’s dune” (that’s the title :).